First-time athletic events can present problems, but swimmers and onlookers were impressed with the inaugural Swim The Avenues 1 and ½-mile events held in Redondo Beach on Sunday. 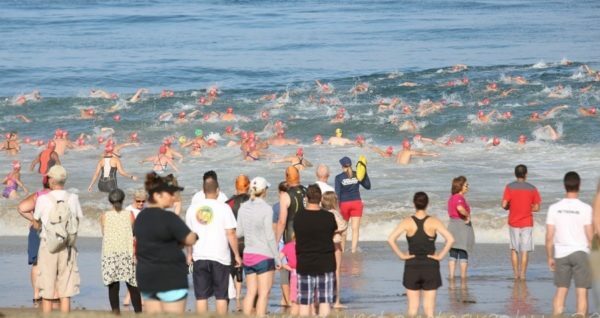 The event received tremendous support from Redondo Beach Mayor, Bill Brand and Council Member Nils Nehrenheim, who were the were the first two people to sign up for the swim. LA Beaches and Harbors and the LA County Lifeguards also gave the race a warm welcome. Winning the 1-mile swim was Ryan Bullock, of Hermosa Beach, who posted a time of 21 minutes, 47 seconds. Following Bullock was Duncan Reid, of Palos Verdes Estates, who finished at 22:11, just ahead of Nolan Wang, of los Angeles, who crossed the finish line at 22:37. Newport Beach’s Lexie Kelly finished 7th overall and first in the Women’s Division with time of 23:48. She bested Elsa Cheng, of Los Angeles, who posted a time of 24:19 and Manhattan Beach’s Maiken Pardon, who crossed the finish line at 24:40. In the wetsuit competition, Christopher Rhode, of Hermosa Beach, had a time of 26:11, defeating David Nelson of Los Angeles (26:33) and Hubie Kerns, of Pacific Palisades (26:52). Jennifer Davidson, of Sherman Oaks, won the Women’s title with a time of 29:11. In the ½-Mile swim, Redondo Beach’s Andrew Bonelli emerged victorious posting a time 14 minutes followed by Kevin Fleming of Simi Valley (14:42) and Taj Whitehead of Palos Verdes Estates (15:11). Redondo Beach’s Delaney Herr captured the Women’s title with a 5th overall finish at 15:23. She was followed by Audrey Bonneli of Redondo Beach (16:17) and Heather O’Brien of Hermosa Beach (16:28). In wetsuit competition, Steven Welch of Redondo Beach posted a time of 16:27, defeating Brett O’Keefe of Manhattan Beach (17:45) and Clinton Suber of Van Nuys (20:54). Redondo Beach’s Meg Christianson was the first female finisher to wear a wetsuit finishing with a time of 20:48. She was followed by Puja Khanna of Manhattan Beach (24:1) and Mary Hamilton of Hermosa Beach (28:03). For complete results, visit avtive.com/redondo-beach.